Unlike many Chinese typefaces, the transition between the lightest and heaviest weights of Xin Gothic is smooth and designed to share the same style and design philosophy. 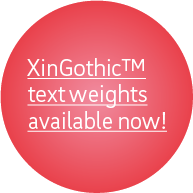 Every weight of Xin Gothic was considered with different applications in mind. For example, W3 is designed for body text in smaller sizes to ensure readability; W7 is more suitable for larger display text in print publications; W1 is suitable for very large display text in advertising that calls for a delicate look (for example cosmetics). A smooth and functional transition of weights play a critical part in solving optical problems that arise when applying to various printing methods, devices, substrate, resolutions, scales as well as reading distances. The strokes of Xin Gothic are crisp yet forceful, with a simplicity that resulted from reducing the characters to their bare essentials. 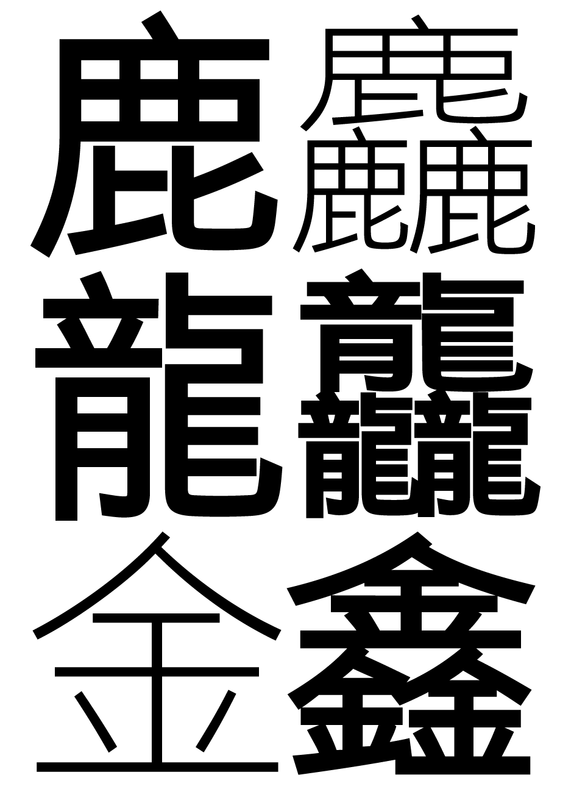 Although monolinear, it possesses the spirit of Chinese calligraphy where each character is dynamic and energetic. The curved strokes are taut and the orthogonal strokes are geometically precise. 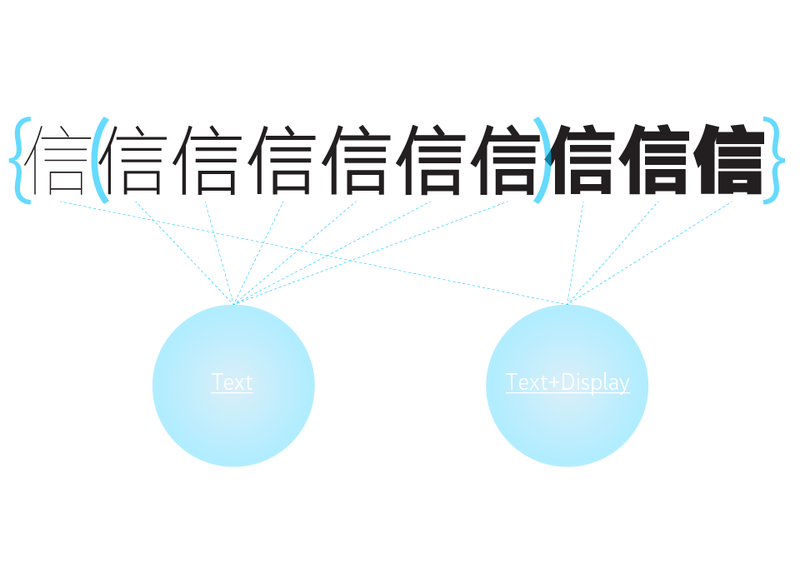 Xin Gothic is an excellent choice for textual communication that call for objectivity, efficiency and integrity. Xin Gothic's Chinese characters uses the Kai calligraphic script from the Han dynasty as a basis to derive its proportions and structure. The strokes radiate from the centre of the em box; the centres of each character are tight and dense, while the peripherals are loose and spacious. This ensures an appropriate amount of space between each character and enable each character to have a distinctive profile, maintaining high legibility as well as readability. This is particularly useful for text setting. 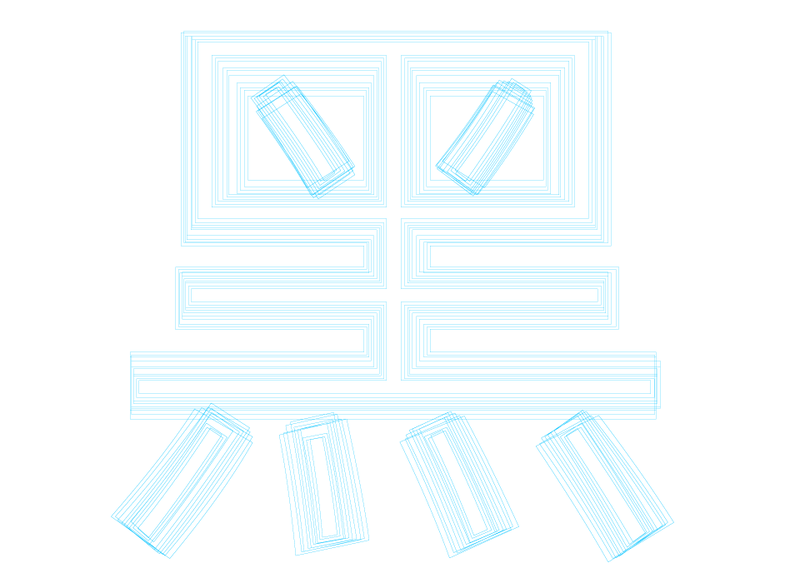 This design matches the reading habits of Chinese people and is a legacy of Chinese function and aesthetics. 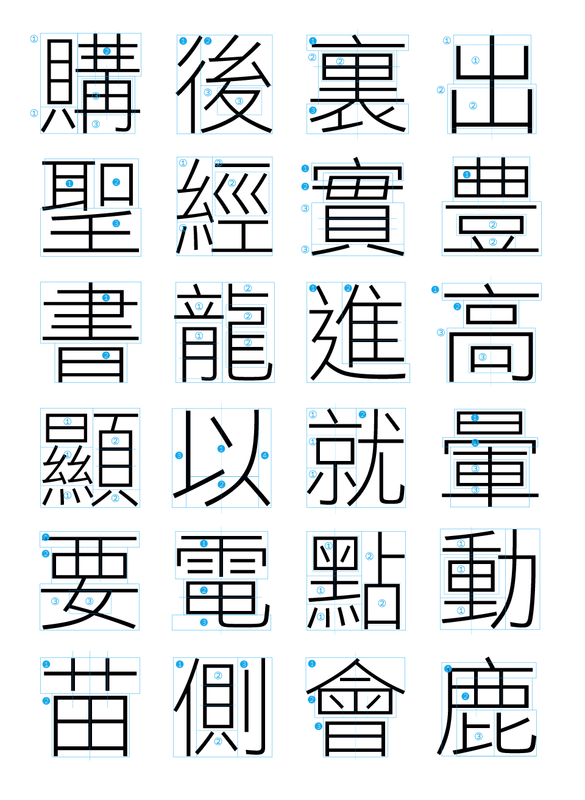 The number of strokes in a Chinese character varies from one to 30, while a typical character set contains more that 20,000 characters. It is no small feet to ensure that all characters share a similar optical density. 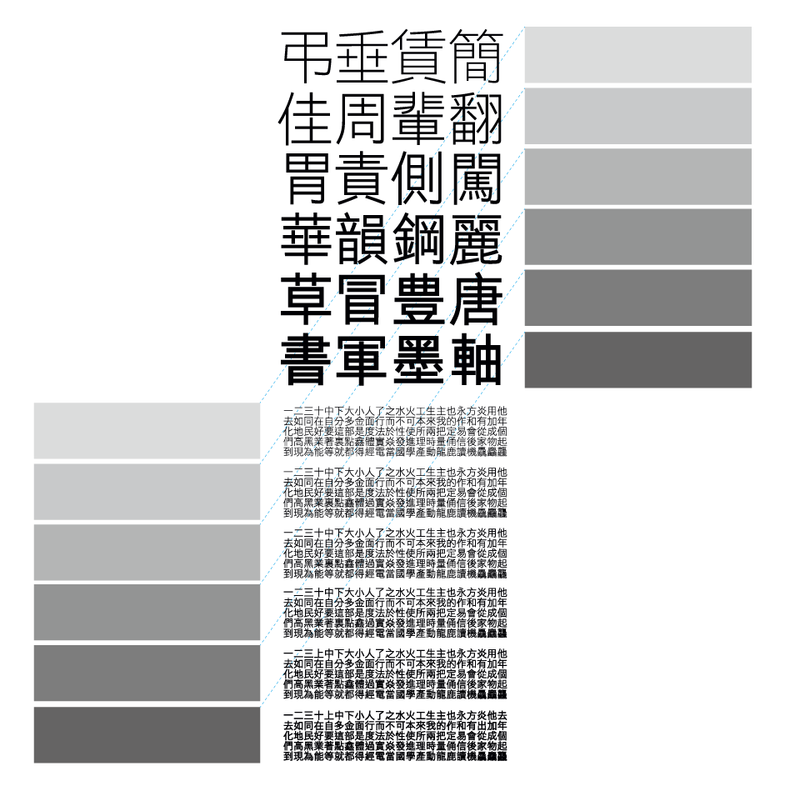 The figure above shows an example of how different density characters are categorized based on the stroke widths of horizontal and vertical strokes. The degree of complexity of each type of characters have to be optically balanced so that no black spots appear when reading a passage of text. 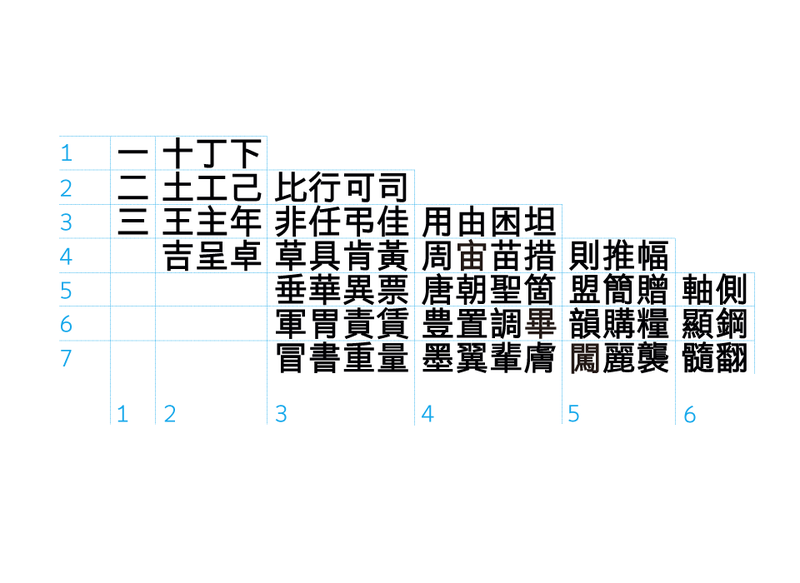 Xin Gothic's Latin characters have been designed to work specifically for mixed setting of Chinese and languages that use the Latin character set. Using the 'Grotesque' sanserif style from the early 20th century as a basis, the letterforms are slightly condensed and square, approximating the shapes and construction of the Chinese characters. 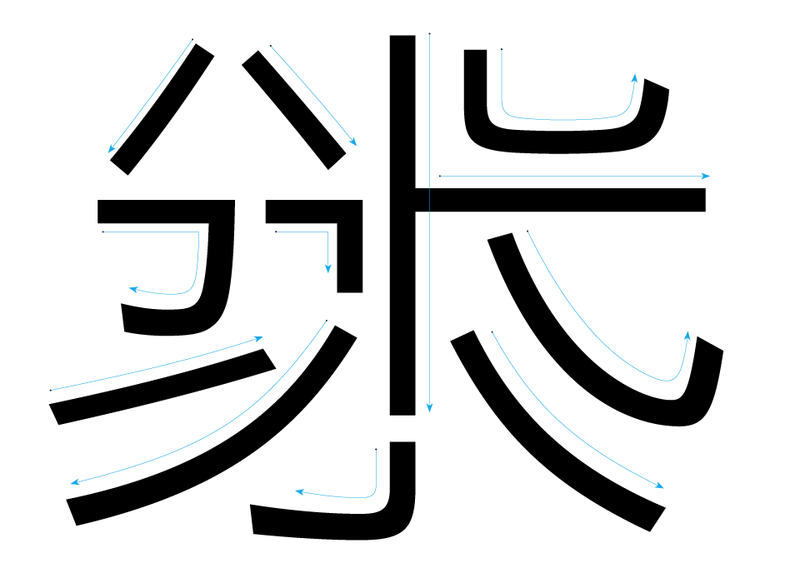 A larger x-height and shortened ascenders and descenders, as well as the slightly thickened strokes, ensure that the Latin characters are optically balanced with the size and weight of the Chinese. The condensed Latin also avoids the problem of uneven spacing often appear in mixed-script setting. For the past 15 years, the Chinese font market almost entered an Ice Age of sorts: vendors rarely investing on new font development, and font piracy became rampant. Any new fonts that do get produced are mostly of a quality that leaves much to be desired. This 15-year 'vaccum' in the Chinese font industry had badly affected the Chinese language publishing industry that are in constant need of high quality Chinese fonts. Advertising agencies, publishing houses and, increasingly, digital publishers have to resort to a limited styles of family series font. Time after time we hear demands for new professional quality, well-crafted Chinese fonts that are suitable for print and for the digital screen. Four years ago, veteran Chinese typeface designer Sammy Or – now Founder and Type Director of VMType – began pondering on the possibility of re-entering the font market as an independent type foundry. With technological advancements and media convergence that one could never have imagined 15 years ago, time was ripe to begin a brand new venture in Chinese typeface design – hence VMType was founded in 2008. Over four years in the makin, XinGothic, the first product of VMType, is scheduled to release in end-2011. VMType is dedicated to providing top quality Chinese fonts for the market. 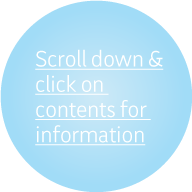 We intend to serve the top 5% of large publishing, technological and creative enterprises who are in the business of creating and disseminating information and knowledge. They are the ones who require professional fonts of the highest aesthetic and technical standards for both printed and electronic publications. Mass-market retail fonts on individuals are not our priority in the short term. A seasoned typeface designer, Sammy Or's career spans 30 years. He is one of the most prolific and important designers of contemporary Chinese typefaces. With a solid grounding in traditional Chinese calligraphy as well as thorough knowledge in current font technologies, Or's typefaces are amongst the most widely used in the Chinese-speaking world today. Or began his work in typeface design as a Sign Systems Designer for the Mass Transit Railway Corporation (MTR) in Hong Kong in the 1980s. At MTR, Or participated in the development of a corporate typeface for its wayfinding system, which is still in current use. Subsequently, he was employed by the Hong Kong branch of the Monotype Corporation as Type Manager and Chief Typographer. 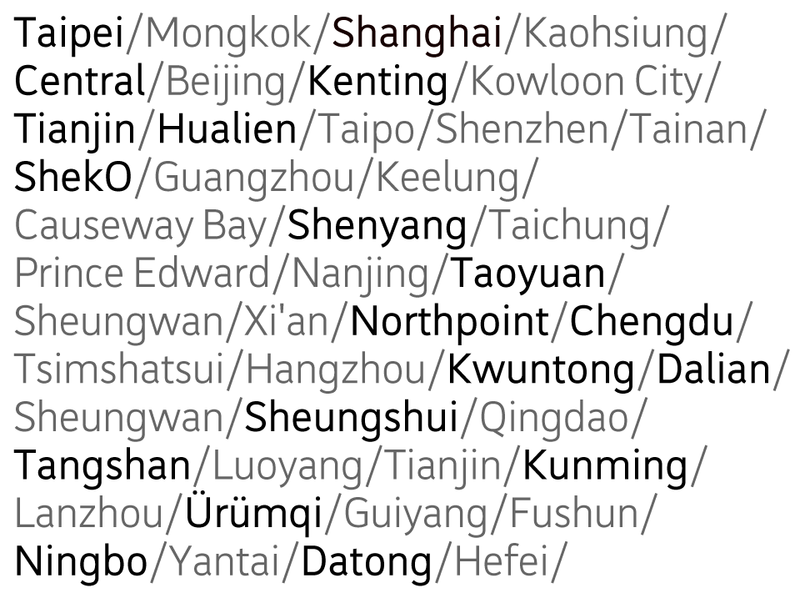 While at Monotype, Or developed over twenty Chinese typefaces, including the first Chinese digital LaserCom fonts for the Hong Kong Government's Printing Department. The Monotype Sung and Hei families – typefaces of choice for numerous publications as well as the Hong Kong Government—are also his designs. In 1989, Or founded TTL Technology Limited. 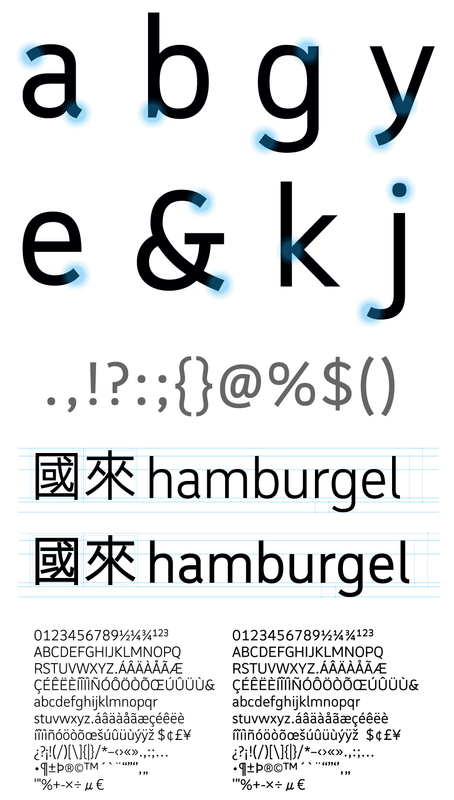 LiSung and LiGothic were the first Chinese outline (Postscript) fonts designed and developed for Apple Computers. These remain system fonts in the Macintosh operating system to this day. He also designed and marketed the popular 'Li' family of over thirty typefaces. In 1992, Or assumed the position of Vice-president and Chief Font Designer of DynaLab Inc., a preeminent font manufacturer in Asia. Or has also been a project-based development consultant for Bistream Inc. for serveral years, designing CJK stroke-based technologies for international fonts. He is also a guest lecturer at the Hong Kong Polytechnic University. Xin Gothic's Text pack, and the coming Full pack is currently under development, would not finish until late August (Full pack in 2012). So please don't hesitate leaving us message and contact information if you are interested in Xin Gothic, so that we can get you back as soon as Xin Gothic family is available for licensing, and critical updates in XinGothic.com. I would love to receive update notifications from XinGothic.com. 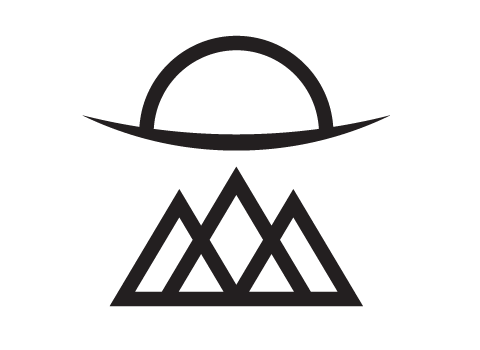 Copyrights © 2008–2014 Visionmark Limited. All rights reserved.